Create a long-lasting favorable impression with customers and prospects when you use letterhead printed by Cloud3.ca. Our high quality letterhead printing gives your organization a truly professional look — whether you’re a start-up company or have been in business for decades. And you get more for your money with our affordable letterhead printing prices. 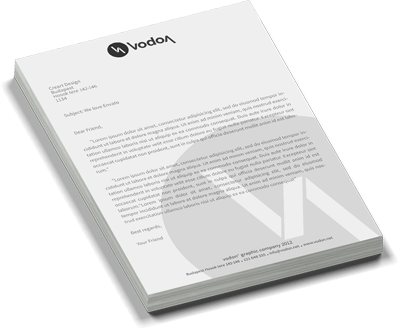 Well-designed and eye-catching letterhead positively shapes people’s attitudes about your company. So does high quality letterhead printing. The full-color letterhead printing of Cloud3.ca will help present your company favorably, every time you send a letter. Complete your organization’s identity package by also ordering our full-color business cards and envelopes. High quality letterhead printing — and business card and envelope printing — is critical to projecting a successful image for your organization.